I had some free time today and I thought about cutting some squares as a Leader-Ender project (one of Bonnie Hunter’s ideas). But, that seemed like a lot of effort. So I dug around my UFO pile and uncovered this beauty…John Flynn‘s Glorified Nine Patch. Background (long story)…I started this quilt at Quilt Camp in the Pines back in 2009. I took a class with John Flynn the first time I went to Quilt Camp in 2004. That first class was for a double wedding ring quilt and I had only been quilting for about six months. Me + curves = disaster. That one is still in the UFO pile almost ten years later! But, John was a very entertaining teacher. He is a former engineer and has a gruff demeanor but a dry, quick wit. One year I ate lunch with him and we laughed so much from people watching. Another year, I took his class on the Storm at Sea pattern. 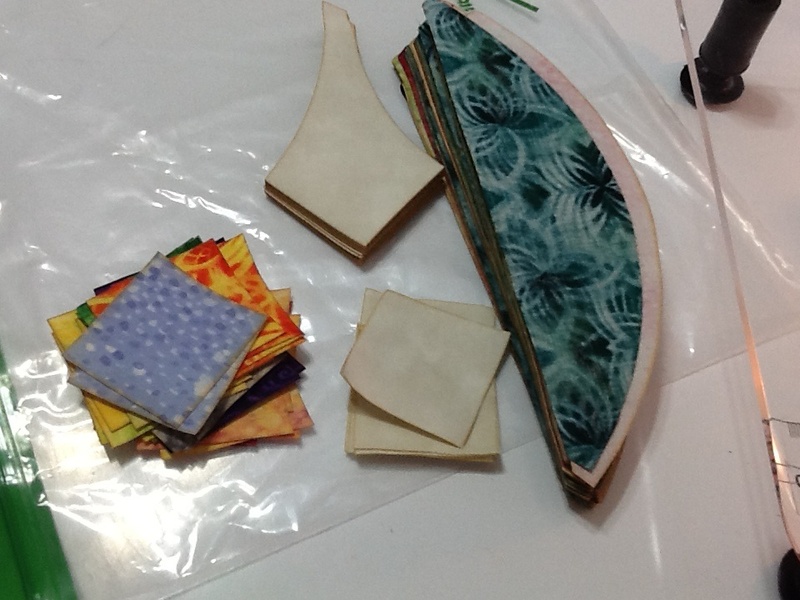 He offered kits with his laser-cut fabric, but I was determined to do that in the classic blue colorway. Most of my time was spent cutting while my friend walked out with her top half done. Lesson learned. So, for the Glorified Nine Patch, I bought the kit. It will be a bright scrappy collection of batik-ish prints. 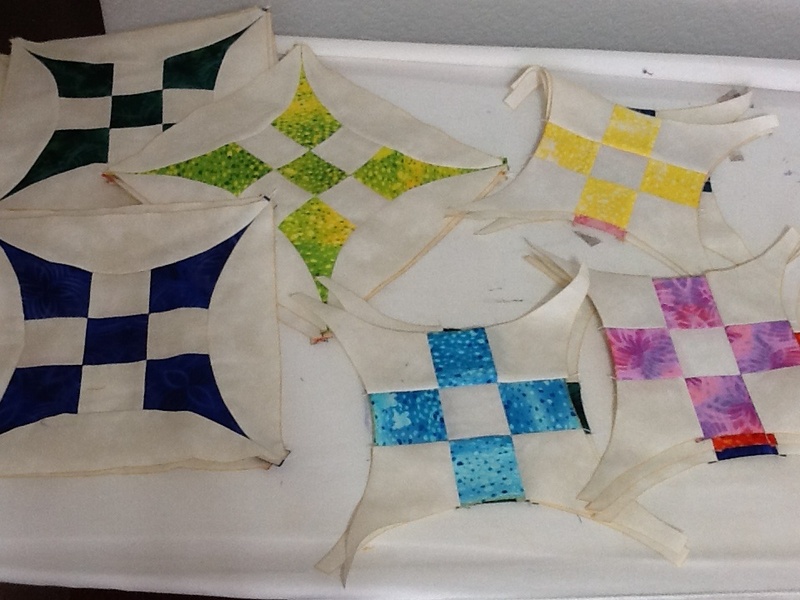 Now that I am an “experienced” quilter (ha!) the curves are going together without much trouble. Maybe I should find that double wedding ring next! Ravelry is all a-buzz with excitement over the next Stephen West Mystery Knit=along. I knit his Rockefeller pattern last summer, and I love the anticipation of a mystery project. Mr. West has named this year’s version “Color Craving” and his teaser photo shows lots of neon pink, yellow and orange. 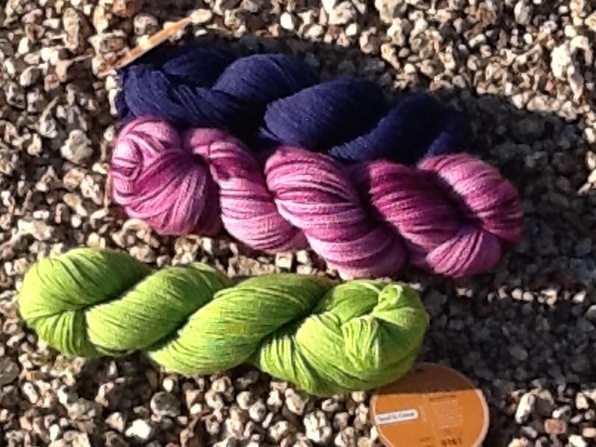 I had the pink/purple variegated in my stash, so I paired it with a yellow-green and a navy blue. The first “clue” comes out on September 13th, which gives me something to look forward to since I hit a snag with my Evolution shawl. The knitting gods decided to teach me a lesson about lifelines and lace. I knit about half a row of the purl side in the lace section, and had to set the project down. Came back the next day, and some stitches fell off the needle. Did I stop to carefully check that the previous row was intact? No! I just picked up what I thought was correct and continued purling. oops. The next knit row did not meet the stitch count. Oh well, just add another stitch. Count obsessively on the next row, and it’s still screwed up. think I can live with it, knit a couple more rows. Nope, stitch count is still screwed up. Time to rip it out! That is where a lifeline comes in. If I had threaded some smaller yarn through the first row of my lace section, I could rip with out a second thought. Now I have to find a place to thread in a lifeline, then carefully rip and see if it works out. Ugh. But that’s a project for another day. Maybe I can start the swatch for my mystery shawl instead, lol.